RV boondocking & dry camping is one of the most economical way to RV and save money like crazy! There are some popular spots many full time RVers like to go when boondocking - like Quartsize, Arizona. There you'll find new and old RV's parked all over in the desert. 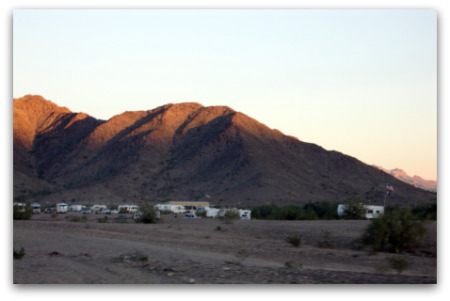 Many RVers love to trek around the desert hills on their four-wheelers, do some campfire cooking, and socializing. There are vendors with tents selling food, crafts and RV products such as solar screens, or repair work. It's a fun and relaxed environment for RVers and many folks return year after year. If you enjoy seeing the country economically, you can try parking without or with limited amenities known as boondocking or dry camping. Where are the best places to dry camp? 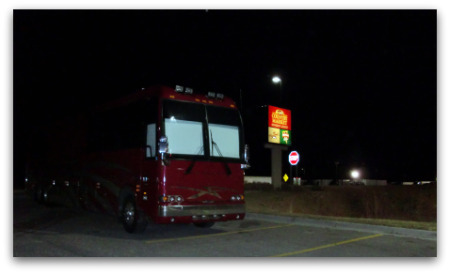 Some RVers stop at Wal-Mart for the night instead of going into an RV park. Not all Wal-Marts allow overnite parking, but many do. It makes sense if you're traveling and plan to take off early the next day. We always shop at Wal-Mart if we're stopping in their lot to restock before moving on. The same goes for places like the Flying J fuel stop. It's a nice place to fuel up and take a short break. Many locations also have dump stations available. State or National parks can be a good place to dry camp, although some of them may have designated areas and charge a nominal fee for use of the facilities. Bass Pro and Cabela's lots are also good choices to overnite. 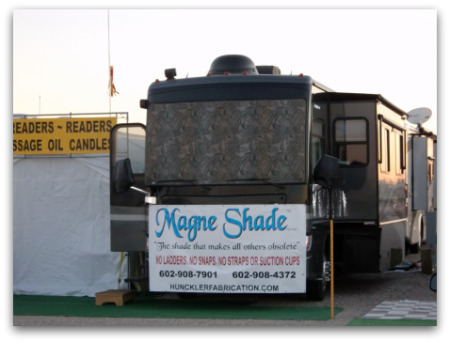 Other great places to dry camp is in the parking lot of casinos, racetracks, fairgrounds or festivals. You will find others that have decided to boondock or dry camp at these places, and some may have a designated area, or charge a small fee. Of course, security should be prime factor when you are selecting a place to boondock. Finding a place to boondock in the Eastern United States can be more difficult than in the Western half. Because of the denser populations or more urban settings, there may be restrictions and in some places may be considered trespassing, so you need to be sure to check before you decide to dry camp overnight in some parking lots. Be sure not to choose a spot that is too remote, because it could be dangerous. An annual pass to State and National Parks can be really inexpensive - as low as $10 a year for seniors. It's a great investment for those that like to dry camp often.